At any of today’s chemical, refining, processing, or storage facilities contain large indoor and outdoor areas of plants present a congested array of complex equipment, such as tanks, pumps, pipelines, and valves. Your safety depends on sensors that alert you to the presence of gas or vapor hazards, that if left unchecked, could put lives in danger and bring productivity to a standstill. Traditional sensors rely on a sense of smell to detect trace amounts of gas emanating from the leak. No matter how many of these smell based sensors you install, if a leak doesn't contact the sensor, it could go undetected leaving you oblivious to the potentially dangerous situation. Gas leaks are affected based upon density, ambient temperature, nearby air ow including wind, and other factors. Despite the number of fixed gas and flame detectors installed within a given system, a leak or flame can still go undetected if it doesn’t reach a gas sensor or can’t be seen by a flame sensor. Given the difficulties faced by the best sensing technologies, a new strategy in gas and flame protection has emerged for use within industrial plants. A better, more reliable system is to use the human sensory model to provide layers of protection when monitoring hazardous environments. With this approach smell based detectors are just the beginning. To enhance detection, integrate optical open path infrared gas sensors, along with gas imaging and optical flame detectors. These allow detectors to actually see a gas leak or flame across wide areas that traditional sensors might miss due to environmental factors such as wind. 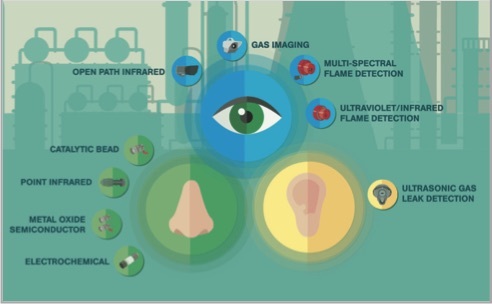 Catalytic bead detectors“sniff” gases, infrared and optical type sensors “see” gases and flames and ultrasonic sensors “hear” gases. 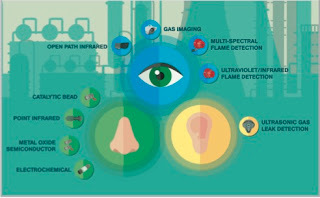 If detectors react in ways that resemble those of humans, that is, based upon intelligence and retained past memories, then layering sensor technologies throughout the plant can achieve a sensory chain of defense against hazardous gases and flames. To complete the human sensory model add ultrasonic gas leak detectors that can hear the gas leak that might go unnoticed by traditional gas detectors. These sensors form a chain of defense against the hazardous effects of gas release, with the widest portfolio of gas flame detection products available, we are able to tailor a multi-layered solution optimized for your facility.